Moving to Georgia? You've made a great choice! The Peach State is a beautiful and diverse place to live with a little something for everyone. Outdoorsy types will bask in the beauty of the Appalachians and can take part in hiking, climbing, hunting and fishing all over the forests and foothills of Georgia's mountains. If the country isn't your thing, there's plenty to do and see in Atlanta. This fast-paced, diverse city is booming with business and job opportunities. In fact, over 75% of Fortune 1000 companies have set up shop in Atlanta, Georgia, making it one of the top business cities' of the South! Not ready to join the job market just yet? Savannah, Georgia is a beautiful, quaint seaside town with one of the best art schools in the country. Georgia has many top notch colleges and universities, such as SCAD (the Savannah College of Art and Design), Georgia Tech and the University of Georgia (UGA). And with affordable housing prices and low cost of living rates, Georgia is hard to beat. www.Georgia.gov - Perhaps the best place to start your search is on the Peach State's official website. You can search the site for practical information regarding housing prices, school ranks, the economy and the current job market. But let's not forget all the fun stuff Georgia has to offer! 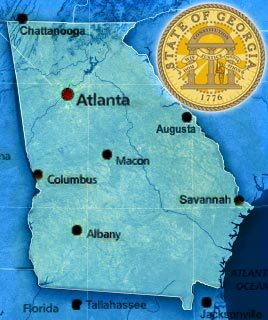 Georgia.gov has a length list of lifestyle, recreation, culture, and media activities to do in and around all of Georgia's major cities. www.Georgia.org - This culture-centric site is the official website for the Georgia Department of Economic Development (GDEcD), which focuses on attracting new business entrepreneurs to the State. If you're an enterprising individual with an eye on Georgia, this moving resource is just for you. The GDEcD has compiled great links and information on Georgia's tourism, investment opportunities, and media and entertainment industry. Georgia Moving Forum by City Data - The only way to know about the best neighborhoods and activities any city has to offer before moving is by talking to those who already live there. City Data has a great moving forum to help you connect with others who have already endured the arduous task of moving to another state. You'll get first hand accounts on which neighborhoods are safe and family friendly, as well as unbiased facts about traffic, taxes and more! Moving On Up, Inc. is headquartered in Georgia's neighbor state, Florida, and specializes on long distance interstate moves up and down the East Coast. We move residential homes, apartments, commercial offices, vehicles, pianos, antiques, fine art, and more. Contact Moving On Up today to request your free moving quote. Have any questions regarding your Georgia move? We'd love to help! Contact us Monday through Saturday toll-free at (800) 945-9569. Our moving consultants will be happy to assist you with your coverage questions.